This sautéed crabmeat makes a tasty main dish or appetizer. 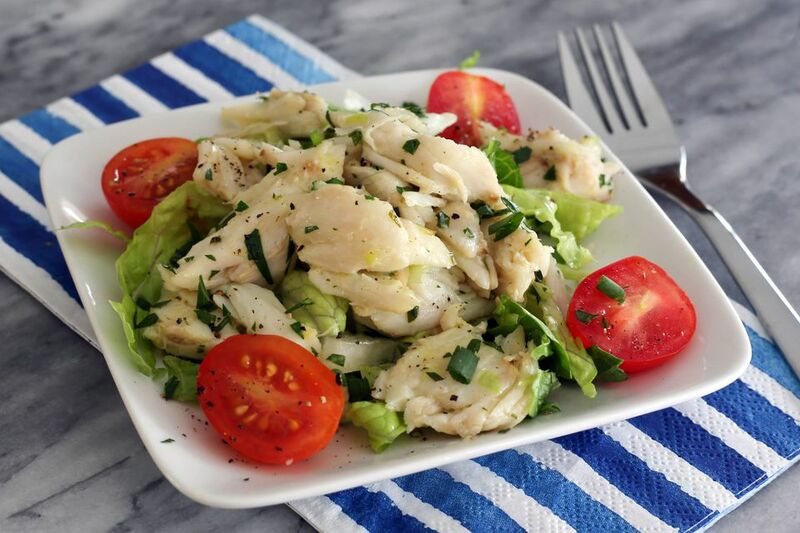 Chunks of crabmeat team up with a variety of fresh herbs, garlic, and lemon juice. The combination makes a delicately flavored topping for toast points, fresh salad greens, or puff pastry shells. Or spoon a small amount over baguette slices and serve them from an hors-d'oeuvre tray. Or use it as a filling for small hollowed out tomatoes for a special luncheon. Jumbo lump—aka colossal—crabmeat is a great choice for the sauté, especially if it is to be served as a main dish. The chunks are large and sweet in flavor and perfect for a special meal. If you're using the crab saute as an appetizer, consider regular lump—or backfin—crabmeat or a third grade, special. Both grades are just as flavorful as the jumbo lump. Lump crabmeat has smaller lumps than the jumbo lump, and the "special" grade includes small chunks of lump crabmeat and flaked meat from the body. Plus, lump crabmeat and special crabmeat are both cheaper than jumbo lump. Melt butter in a large skillet over medium-low heat. Mince the garlic and green onion. Add them to the skillet and cook for about 3 minutes. Do not let the garlic brown. Stir frequently. Add the crabmeat to the skillet and toss with the garlic and green onion. Cook while stirring gently until thoroughly heated. Sprinkle the crabmeat mixture with the chopped chives and parsley. Drizzle with the lemon juice. Serve the crabmeat sauté on a salad or fresh greens, on toast points or baked puff pastry shells, or spoon it over hot cooked rice. Unless you buy fresh crabs, you'll most likely use pasteurized crabmeat, which comes in sealed containers. Always check the "best by" date when you buy pasteurized crabmeat. Pasteurization simply means that the crabmeat has been heated and cooled using a special process to destroy any harmful pathogens. Pasteurized crabmeat has a long shelf, but it must be kept refrigerated. Once it has been opened, however, it should be eaten within 2 days. If the crabmeat has been cooked, refrigerate leftovers and eat within 3 days. The price of the crabmeat depends on the grade. Jumbo lump is the most expensive grade, with lump, special, and claw following with lower price points. Shelf stable crabmeat is usually inferior when compared to fresh or pasteurized. Miller's Select brand offers canned jumbo lump, special white, and claw, and their products get consistently good reviews. If you have a favorite brand of canned crabmeat, feel free to use it instead of pasteurized or fresh.